Using a pair of chain-nose pliers, round-nose pliers and flush-cutters, form a 5mm loop on one end of a 1-inch length of 18-gauge textured sterling silver wire. Create a 5mm loop in the opposite direction, creating a figure eight. Repeat to create seven figure eight links. Form a 12mm loop using a 1-inch length of 18-gauge textured sterling silver wire creating a 12mm jumpring. Repeat to create a total of twelve 12mm jumprings. Repeat to create thirteen 6mm jumprings using 1/2 inch lengths of 18-gauge textured sterling silver wire. Form a V-shape in the center of a 3/4 inch length of 28-gauge sterling silver wire. Using chain-nose pliers, bend 2mm on one end of the wire to a 90 degree angle. Repeat on the other end of the wire to create a bail. Repeat 5 times to create six bails. Fit the ends of the bail through the hole on a 6x5mm faceted teardrop hessonite bead. Use a pair of chain-nose pliers to compress the picks of the bail further into the bead. Repeat to attach a bail to three 6x5mm faceted teardrop hessonite beads and three 8x5mm flat briolette citrine beads. Using a fine grade of sand paper, gently sand the 3-3/4 inch length of 10x5mm elongated cable chain and a 10.5x6mm swivel lobster claw clasp to create a matte finish. Open a 6mm fancy jumpring. Pass it through the loop on the clasp and the first link on the 3-3/4 inch length of 10x5mm elongated cable chain. Close the jumpring. Open a figure eight link. Pass it through the last link on the 3-3/4 inch length of 10x5mm elongated cable chain. Close the link. Open a 6mm textured jumpring. Pass it though the opposite side of the figure eight link, a 12mm textured jumpring and the first loop on a figure eight link. Repeat to attach a second 6mm textured jumpring next to the first jumpring creating a double jumpring. Repeat four times for a total of five sets of links. Open a 6mm textured jumpring. Pass it though the opposite side of the last figure eight link and 12mm textured jumpring and the first loop on a figure eight link. Repeat to attach a second 6mm textured jumpring next to the first jumpring. Open a 6mm smooth jumpring. Pass it through the bail on two 6x5mm faceted teardrop hessonite beads and the first link on the 3-3/4 inch length of 10x5mm elongated cable chain. Close the jumpring. Repeat to attach one 6x5mm faceted teardrop hessonite bead to the first link on the 3-3/4 inch length of 10x5mm elongated cable chain. 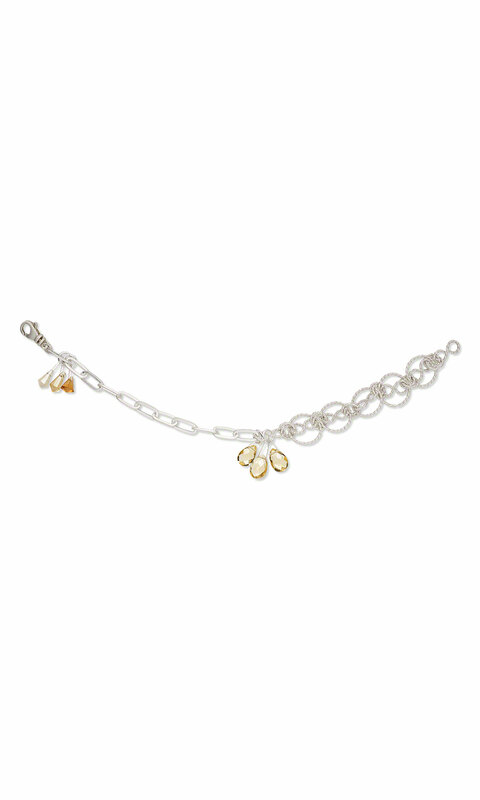 Repeat to attach two 8x5mm flat briolette citrine beads to the first half on the first figure eight sterling silver link. 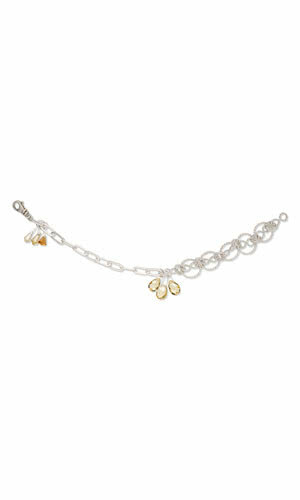 Repeat to attach one 8x5mm flat briolette citrine bead to the first half on the first figure eight sterling silver link.